Walmart was founded by Sam Walton in 1962. When I think of Walton two things comes to my mind (1) He invented practically nothing. But he copied everything anybody else ever did that was smart. He is a terrific cloner (2) He understood human psychology very well. He never let his purchasing agent take a handkerchief from a salesman. He understood the power of reciprocity. Take a look at the data given below which compares Walmart in 1974 vs 2014. What do you see? At this rate of compounding $1000 invested in Walmart in 1974 will be worth $2.51 million in 2014. What does this tell you? Sticking with a great businesses for a very long time will make you extremely rich even if you pay up to begin with. Walmart is the largest retailer in the world. It sells all kinds of products through its 11,000 retail stores under 71 banners in 27 countries and has e-commerce websites in 10 countries. It employs 2.2 million associates. Its operations consists of three reportable business segments (1) Walmart US (2) Walmart International (3) Sam’s club. Let us look at each one of them in detail. Walmart US accounts for 59% of total sales and 83% of total operating income in fiscal 2014. In the US it operates 4 formats (type) of stores. Each format differs in (1) size (2) items it sells (3) number of associates who works there (4) its location. Given below are the different store formats it operates. Why do you need so many store formats? Depending on the location and needs of the people it operates stores in different formats. If you want to learn more about these formats go here. In the last few years Walmart has more than doubled its total number of smaller stores. Also in fiscal 2015 it is planning to add another 270 to 300 smaller stores. Why is the company opening up smaller stores? The small store fleet has continued to deliver positive comp sales and traffic increases each quarter. Comp sales for Neighborhood Market stores grew approximately 4 percent for fiscal year 2014, driven by fresh and pharmacy. Walmart currently operates 346 Neighborhood Markets and 20 Walmart Express stores. The Express units have performed well and are being expanded beyond the initial three-market pilot. As a result of its more aggressive plan, Walmart U.S. projects to end fiscal year 2015 with net retail square footage growth of approximately 21 to 23 million square feet across all formats, versus its original projection of approximately 19 to 21 million square feet. The projected capital expenditures and square footage details exclude the impact of future acquisitions. Do you know how the products you buy at Walmart get there? Every year, it moves millions of products from manufacturers to Walmart distribution centers, and from distribution centers to the shelves in its stores. 80% of merchandise are shipped through its distribution facilities. Each distribution center is more than 1 million square feet in size and it supports 90 to 100 stores in a 200-mile radius. It operates a fleet of 6,500 tractors, 55,000 trailers and more than 7,000 drivers. Each driver averages around 100,000 miles annually – that’s like driving around the world 4 times. In fiscal 2014 it had 132 distribution centers supplying to 4,203 retail stores in the US. Distribution center is the heart of Walmart. Walmart International accounts for 29% of total sales and 20% of total operating income in fiscal 2014. It operates in 26 countries. 80% of merchandise are shipped through its distribution facilities. In fiscal 2014 it had 151 distribution centers supplying to 6,107 retail stores. It operates units in three major categories retail, wholesale, and other. These categories consist of numerous store formats. Acquisition is one of the strategies it uses to expand internationally. Sam’s Club accounts for 12% of total sales and 7% of total operating income in fiscal 2014. It operates on a membership basis. Regular membership costs $45 and premium membership costs $100. Members include both business owners and individual consumers. Why would members pay a fee to shop? Sam’s club is a wholesaler. Customers can buy items in bulk at a much cheaper price. Hence they do not mind paying a nominal annual fee. 64% of merchandise are shipped through its distribution facilities. In fiscal 2014 it had 23 distribution centers supplying to 632 warehouse clubs. I am going to look at Walmart’s business in 5 years increments starting from 2004. Why am I doing this instead of looking at year over year changes? Human brain works on a contrast scale. It is not good in identifying changes when it comes in small pieces (contrast effect). But it is very good in spotting trends over longer periods. What do you see from the table given below? Walmart international is growing its total retail stores and square footage faster than the other two business segments. Also Sam’s club is growing at a very slow rate. 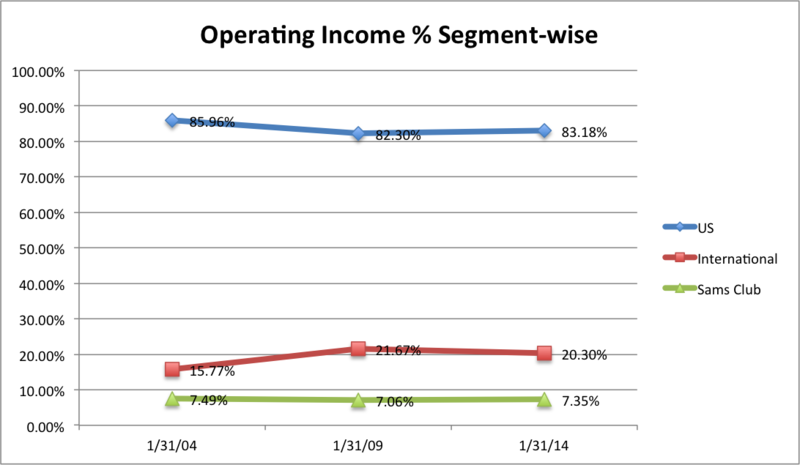 Given below are the sales and operating income data broken down into different business segments. What do you see? There are several things that I see (1) International segment is growing faster than the other business segments (2) Lion share of operating income comes from the US business segment (3) Operating margins for the US segment is twice compared to the other business segments. 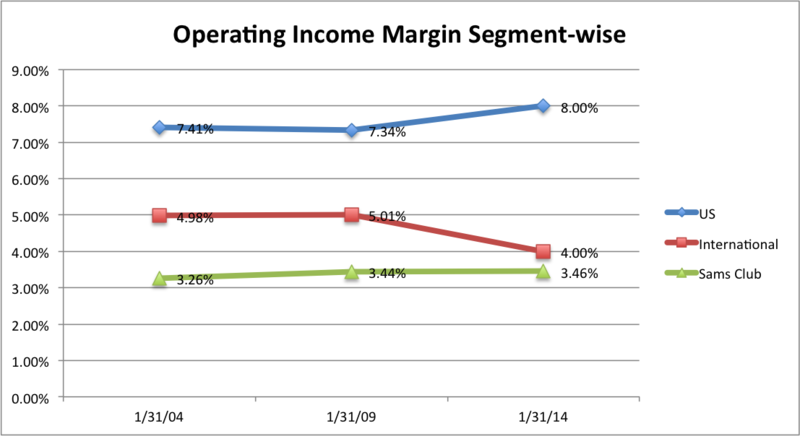 (4) Total sales and operating income grew at mid single digits. Given below is the table showing invested capital and its source. Also it shows the operating and net income generated using the invested and equity capital. What do you see? 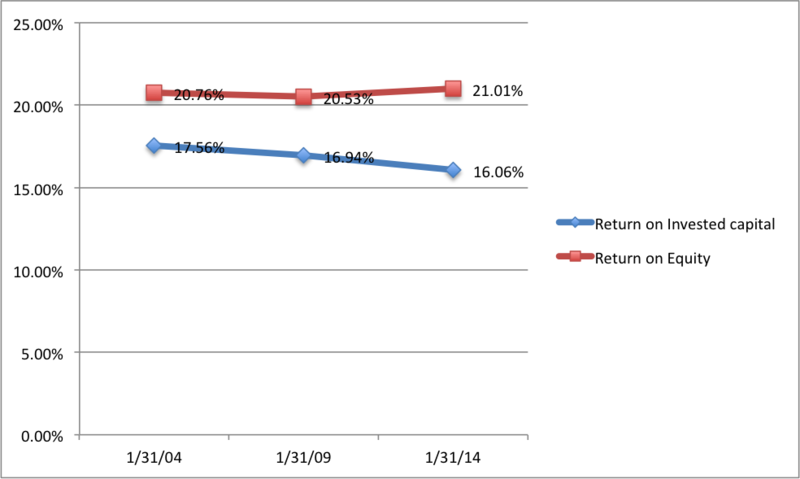 There are few things that I see (1) ROE of 21% and ROIC of 16% are really good returns. Generating 16% on invested capital of 167 billion and 21% on equity capital of 76 billion is not a joke. Look around you and see how many business can do this. There will not be many. (2) Equity grew at a compounded rate of 5.21% (3) The company uses debt wisely to fund its business. This is reflected in higher return on equity. Walmart eCommerce (online) sales for fiscal 2014 reached $10 billion mark. On $473 billion total sales, eCommerce only represents 2% and this is a drop in the ocean. Hence the right way to think about Walmart it to see how much sales, operating, and net income it generates per square footage. The table given below does the per square footage calculations. On average for one square foot it makes $429.30 on sales, $24.64 on operating and $14.68 as net income. In the last 11 years these numbers have been very consistent. Capitalism guarantees that competitors will emerge like bees to honey and will try to take away your market share. Moats are structural characteristics of the business that will create barriers for the competitors to enter into your turf. Let us do a Porters five force analysis for Walmart. Threat of New Entrants – Let us imagine that a new entrant is trying to dislodge Walmart. He will start with a single store. There are few challenges he will face. The suppliers of products will not sell it to him at the same price as Walmart. So he will not have any pricing power with the suppliers. Also he cannot pass on the high price to the customers. Why? No customer will pay higher price for an unknown store if they can get it for a lower price at Walmart. Hence he needs to sell his products at a loss to gain market share. How long should he operate on a loss before make a dime in profits? It is very hard to tell. But we can look at history to find out how much time Amazon took before making a profit. Look at the table given below. 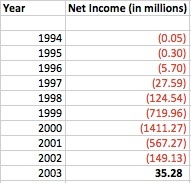 In the first 9 years Amazon lost $3 billion and finally made $35 million in the 10th year. Even for a smart guy like Jeff Bezos this was not an easy task. From this we can conclude that a rational person will not get into retail business and hence threat of new entrants is very low. Bargaining power of suppliers – Walmart is known for squeezing its suppliers to reduce the price so that it can pass on the benefits to its customers. In most of the cases the suppliers do not have any choice and they acquiesce. The core of retail business is to buy an item from a supplier for X and sell it to the customers for (X + Y). Hence by looking at the gross margins of Walmart we can find out if suppliers have any power. 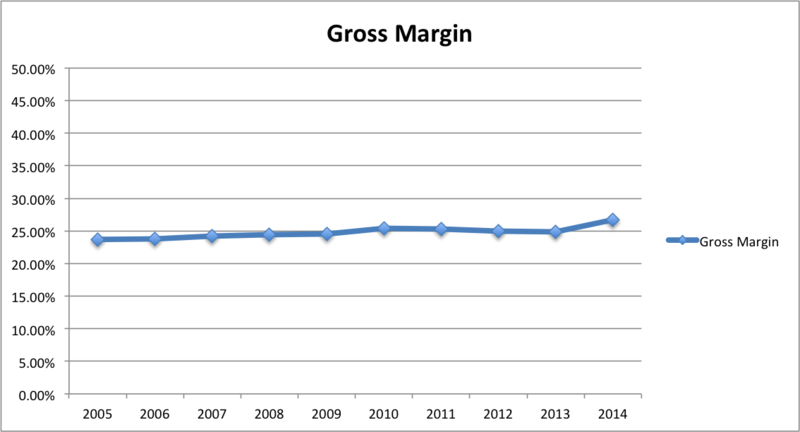 Given below is the gross margin of Walmart for the last 10 years. It is almost a straight line. 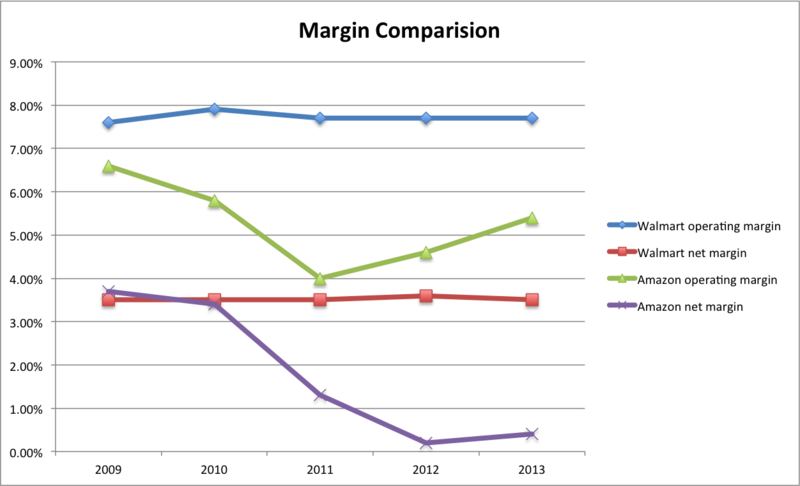 The average gross margin comes to 24.79% with a standard deviation of 0.89. This shows that the bargaining power of suppliers is low. Bargaining power of buyers – Customers come to Walmart for its low cost. Every Day Low Prices (EDLP) is its pricing philosophy under which it prices items at a low price everyday so customers trust that prices will not change under frequent promotional activity. Over the years it has created a brand for itself as a low cost retailer which is a powerful moat. On top of this it has scale advantages which helps to reduce its cost and pass on the savings to the customers. Hence the bargaining power of buyers is low. Threat of substitues – As long as human beings are alive retail business is going to stay. But the mode of delivery is definitely changing. A lot of people are buying items through eCommerce websites instead of going to the stores. The question is can Walmart adapt to this change? In fiscal 2014 the eCommerce division made $10 billion in sales and it is growing at 30%. Also the company is investing heavily in technology to increase its eCommerce sales. I believe that Walmart is heading in the right direction as for as technology is concerned. Since it is competing with eCommerce giants like Amazon I am keeping the threat of substitutes as medium. Each operating segment strengthened its e-commerce platforms, and customers responded, driving annual Global eCommerce sales, including acquisitions, above the $10-billion mark, a 30 percent increase. A strong focus on e-commerce is now fully embedded within each of our businesses and we’ll increase our investment as e-commerce opportunities present themselves. Global eCommerce saw strong growth in fiscal 2014, with a 30 percent increase in sales. We’ll continue to invest to enhance technology platforms and expand fulfillment networks, including new facilities in Pennsylvania, Indiana and Brazil. Infrastructure investments help us to be nimble platform, Pangaea, will deliver a world-class integrated customer experience and improve our website speed, flexibility and scalability when it begins to rollout later this year. We’re also leveraging global best practices to increase site visits and add services such as the Asda Direct kiosk – which allows customers to order from online catalogs while they’re still in the store – to grocery delivery and drive-through pickup, which we’re testing in Denver in the U.S. In fiscal 2015, we expect Global eCommerce gross merchandise value, which includes digital sales of Walmart goods and third-party sales through our sites, to exceed $13 billion. Rivalry among existing competitors – Retail industry is extremely competitive. If there is someone who can dislodge Walmart it will be Amazon who sells products through its eCommerce websites. 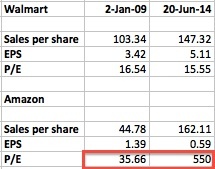 Let us look at the stock returns for Amazon and Walmart in the last 5+ years. 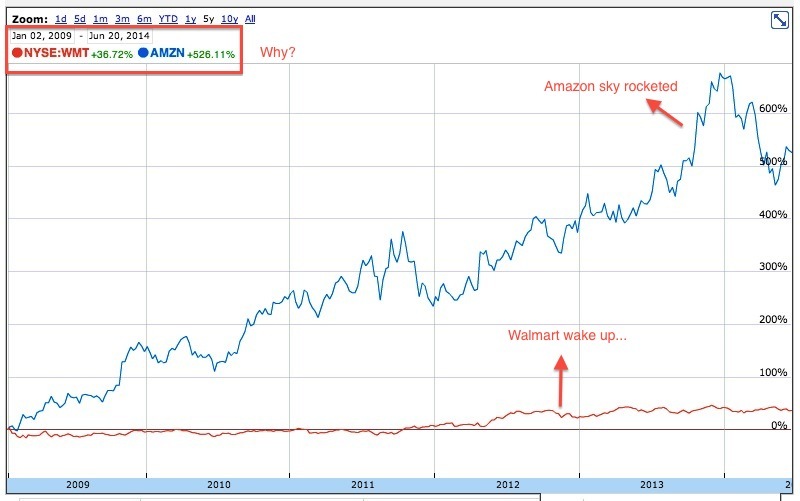 Why did Amazon sky rocket? During this period Amazon grew its sales at 23.91% and Walmart grew its sales only by 6.09%. Because of this market increased its earnings multiple for amazon from 35 to 550. Look at the data closely, you will find that Amazon earnings per share went down by 57%. Market values growth more than anything. But as an investor we should also look at earnings. From the charts given below we can clearly see that Walmart has (1) Better operating and consistent net profit margins (2) Better and consistent return on equity. Amazon is growing at a decent pace and at some point in future it might have built a robust platform with operating leverage which can generate tons of profits. But for now as an investor I see Walmart stock has a better value for my money. But we should not ignore Amazon and closely monitor Walmart’s eCommerce growth. Because of Amazon (Jeff Bezos), I am keeping the rivalry among competition as high. 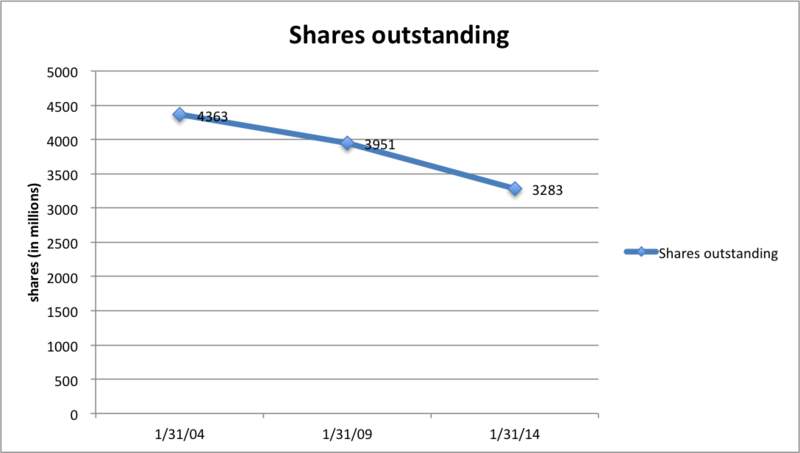 In order to asses the management let us first look at the total shares outstanding. It has gone down by 25% in the last 11 years. This is good for the shareholders. Why? Imagine a business with 10 outstanding shares and $100 as net income. Each share will make $10 ($100 / 10). Now if there is only 5 shares outstanding then each share will make $20 ($100 / 5) on the same net income. This is reflected in earnings per share growth rate. From 2004 to 2014 net income grew from $9.05 billion to $16.02 billion. This represents a compounded growth rate of 5.33%. During the same time earnings per share grew from $2.03 to $5.11. This represents a compounded growth rate of 8.75%. This is the power of share buybacks. From the year 2004 to 2014 the company generated a total net income of $147.43 billion. Of which it returned $41.63 billion as dividends and bought back shares for $68.73 billion. Thus it returned 75% of net income to the share holders. It retained remaining 25% which comes to $37.06 billion back into the business. To find out how I arrived at these numbers click here. As a shareholder we can access the dividends right away as it is cash which gets deposited in our brokerage account. But what about share buybacks and retained earnings? Let us use Buffet’s earnings retention test to find out if this added value. To learn more about it go here. Let us assume that I purchased one share of Walmart on 31-Jan-2003. The closing price on that day was $47.80. I sold the stock on 31-Jan-2014. The closing price on that day was $74.68. The delta increase in stock price was $26.88. During this period the company used $28.31 for stock buybacks and retained earnings. For every $1 the company used the market valued it for $0.95 ($26.88 / $28.31). This is not very impressive. But we need to remember that on 31-Jan-2003 Walmart was selling at p/e multiple of 27 compared to a multiple of 15 on 31-Jan-2014. Even though the EPS grew by 8.75% during this period the overall return for the stock is only 4.14% because of p/e multiple shrinkage. On February 2014 Walmart appointed Doug McMillon as its new CEO. He was born in 1966 and joined Walmart as an hourly associate in one of the distribution centers at the age of 17. Before taking up the CEO role he was heading the international division. He has been working in Walmart for almost 25 years in various roles in all three business segments. I am encouraged about this change. 1984         - Summer associate at a Walmart Distribution Center. 1990         - Began full-time career working at a Walmart in Tulsa, Oklahoma. 2006 to 2009 - President and CEO of Sam's Club. 2010 to 2013 - President and CEO of Walmart International. 2014         - CEO of Walmart. Overall I do not see any red flags with the management. For the fiscal year 2015 Walmart is expected to earn an EPS of $5.33. At the current price of $75.68 the earnings yield to 7.04%. Is this high or low? In order to answer this question we need to look at the opportunity cost. Given below are the yields of other assets that I can invest in. Clearly Walmart is giving a better yield compared to other investments. On top of this the company has a lot of potential to grow its small store formats in the US and also grow internationally. In fiscal 2014 the company has 405 stores in China and 20 stores in India. Around 36% of the world population lives in India and China and hence there is a huge opportunity for growth. During the first quarter Buffett bought 8,568,679 shares of Walmart. He increased his original stake by 17%. How much did he pay for each stock? From 02-Jan-2014 to 31-Mar-2014 the stock traded at a low price of $72.66 and high price of $78.91. He might have paid an average price of $75.79. At this price he invested $649 million into Walmart. As of this writing the stock is selling for $75.68 the average price he paid. Did his purchase coincide with the appointment of the new CEO Doug McMillon? I believe at the current price Walmart is a buy. As of this writing I do not own any shares of Walmart. Thanks Janav, I am enjoying and learning a lot from your blog posts. Thanks and it is a terrific book. Hi Jana, I would like to mention one point that when looking at Amazon results we always need to keep in mind that Jeff Bezos’ objective is cash flow maximisation and not profit maximisation. You can see his guiding principles in the 1997 letter to the shareholders which is reproduced in every year’s AR. 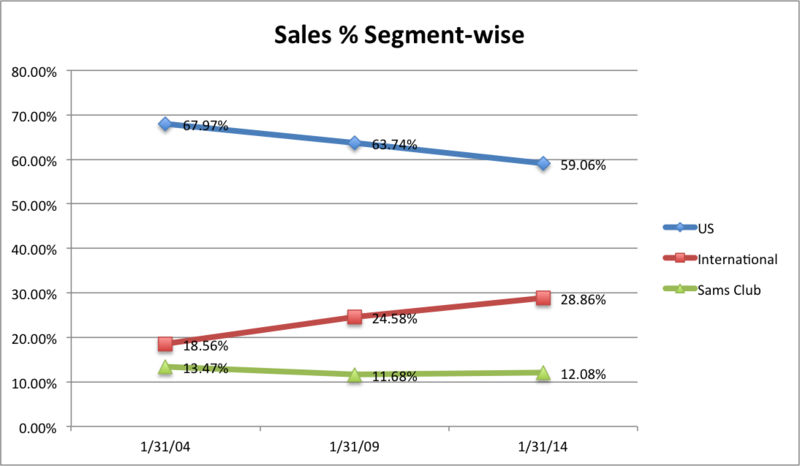 If you see Amazon results over the past 10 years, it has done wonderfully well on that measure. We should also keep in mind this wonderful article http://fundooprofessor.wordpress.com/2012/08/12/flirting-with-floats-part-iii/ from Prof. Sanjay Bakshi when we are valuing companies with significant moats and floats like Amazon. Agreed that Amazon is a terrific business and it can fund its growth through internal operations. Also I like Jeff Bezos a lot and would be happy to partner with him when the price is right. I guess it is a question of simply believing that Amazon would be one of the few companies standing at the end when the dust settles on the global internet retail race.